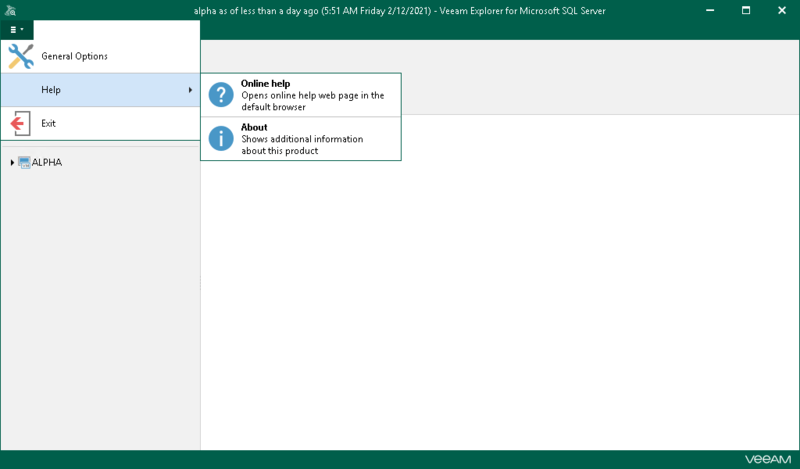 Veeam Explorer for Microsoft SQL Server provides you with the convenient user interface that allows you to perform required operations in a user-friendly manner. General Options. Allows you to configure program options. Online help. Opens the online web help page. About. Shows information about the product. The ribbon menu, which contains general program commands organized into logical groups. The navigation pane, which allows you to browse through the hierarchy of your SQL databases. The preview pane, which shows you the details about objects you have selected in the navigation area.